The virtual cockpit, available in the all-new 2016 Q7 and TT, is an entirely digital dashboard designed to enhance the driver-centric experience with 3D graphics and brilliant clarity. The display combines the functions of traditional gauges with the central MMI monitor in one unique, 12.3-inch TFT display. A quad-core Tegra 30 processor from NVIDIA renders up to 60 frames per second and ensures the gauges and other functions are displayed with absolute precision. The MMI system is further enhanced with an intuitive user interface incorporating the traditional push-turn knob, a multifunction steering wheel, natural voice operation accommodating everyday speech and a touchpad that recognizes signs and finger gestures. In the TT, the MMI touch interface is on the knob, while in the Q7 it is on a separate surface. The Q7 system provides haptic feedback after every entry, while the TT provides audible feedback, if selected in the MMI. This user interface is designed to require less driver attention than conventional systems, minimizing distraction and allowing the driver to keep their concentration on the road. 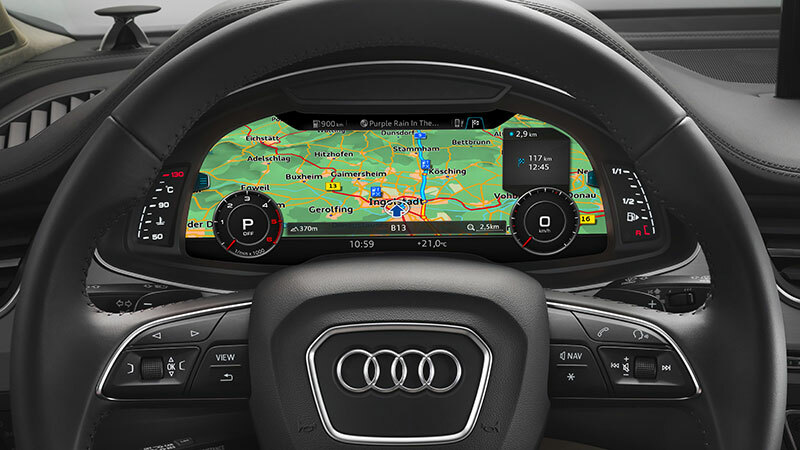 The virtual cockpit and MMI system are connected to the Internet via LTE, which converts the vehicle’s cabin into a Wi-Fi hotspot and allows the car’s passengers to connect their mobile devices to the Internet at broadband speeds while the driver is able to receive customized online in-car services from the Audi connect® portfolio. The new Q7 also includes the Audi smartphone interface which allows a customer to connect an iOS or Android device to call up the Apple CarPlay™ or Android Auto platform onto the car’s MMI monitor. Both platforms provide navigation, messaging functions, appointment reminders and other features that can also be accessed by the vehicle’s passengers, further minimizing distraction for the driver. Another innovation in the Audi Q7 cabin is a revolutionary portable Rear Seat Entertainment system called the Audi Smart Display, an Android tablet that fully integrates with Audi connect and the MMI system in the vehicle while allowing rear-seat passengers the freedom to explore content from the vehicle or the cloud. Last but not least, the Audi Q7 includes telematics services such as Emergency Call, Vehicle Services, as well as Remote Service functions which can be accessed via app and through wearables. The “Product of the Future Awards” were chosen by Popular Science editors after examining thousands of devices on the showroom floor of CES 2015. Only 10 innovative products were ultimately chosen for the awards. Please visit www.audiusa.com for more information about the Audi virtual cockpit and MMI system.